Blaming the victim: Belief in control or belief in justice? The attribution of responsibility to victims of bad fate (“blaming the victim”) is discussed under the perspective of Just World Theory (Lerner, 1980) and the Defensive Attribution Hypothesis (Walster, 1966; Shaver, 1970). Whereas Just World Theory suggests that the belief in a just world is the decisive motive of increased attributions of responsibility, the Defensive Attribution Hypothesis assumes that these attributions are motivated by the need to believe in internal locus of control. Research evidence shows both motives as conceptually linked and empirically correlated. The central question is whether belief in a just world and belief in internal control are facets of the same latent variable or empirically distinguishable constructs, and whether they contribute independently to attributions of responsibility and blame to victims of misfortune. Results of a questionnaire study assessing opinions about cancer and cancer victims are reported. There is evidence from factor analyses that the two motives are indeed distinguishable constructs. The correlation patterns and the results of multiple regression analyses show that both motives are meaningfully related to attributions of responsibility. Moreover, it is suggested that belief in a just world is not a homogeneous construct. Belief in immanent justice according to which present misfortune is seen as a consequence of prior faults and sins is differentiated from belief in ultimate justice according to which one can be sure that present misfortune will be compensated in the long run. 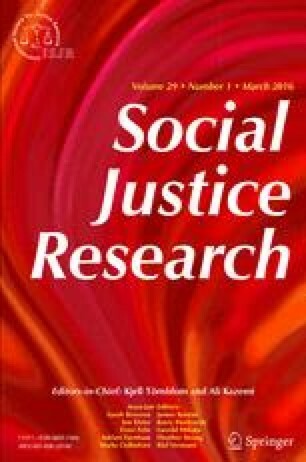 Whereas belief in immanent justice is the most important predictor for attributions of responsibility, the suggested emotional consequences of such attributions, like belief in invulnerability or confidence in coping, can be predicted by belief in internal control and belief in ultimate justice. Finally, suggestions are made to extend Just World Theory to clarify the function of justice motives in the person's search for meaning in his or her life.